Measurement with FTIR (Fourier transform infrared spectroscopy) is very valuable in terms of speciation of pollutants, real-time results, and accurate determination of compliance with federal requirements. Sampling with heated Teflon ® PTFE tubes, however, can positively bias test results. This can lead to violations, fines, and un-planned shutdowns. Clean Air Engineering can provide heated sample lines that incorporate 304 stainless steel sample tubes, to prevent this positive bias. These lines are available with permanent or removable tubes, designed for continuous operation at 400° F. When used with a Teflon calibration tube, these sample lines provide a robust solution for highly accurate testing. The FTIR heated sample lines feature an electrically heat traced and insulated 1/2" O.D. by 3/8" I.D. Teflon ® PTFE sample line with optional 1/4" Teflon calibration line, 3 pin Amphenol power connector, and 2 type K thermocouple plugs. Protected by a durable scuff resistant extruded polyurethane jacket. *Temperature controller optional. The removable Stainless Steel liner Part Number is 0723SSL. The removable S.S. liners outer deimension is 1/4" (0.250” O.D). The liner material is made from High-efficiency tubing because it can be bent and used in many applications. The removable line is also Acetone rinsed and capped to retain purity. 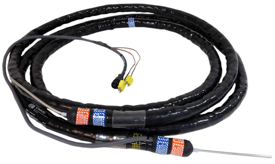 Lower resistance heaters requires less power to heat lines. A backup type K thermocouple to prevent project delays in the case of primary thermocouple failure in the field. Durable extruded poly-urethane jacket for protection of sample/calibration lines from abrasive failure in the field. Inert teflon ® PTFE calibration lines will provide more accurate results by eliminating potential bias from other materials. Teflon is also more corrosion resistant than tygon, and can be washed with acetone without degradation.